ANONYMOUS - Plan du Port Mahon et de ses fortifications. Title : Plan du Port Mahon et de ses fortifications.. Date : Minorca ?, after 1756. Size : 8.3 x 14.0 inches. / 21.0 x 35.6 cm. 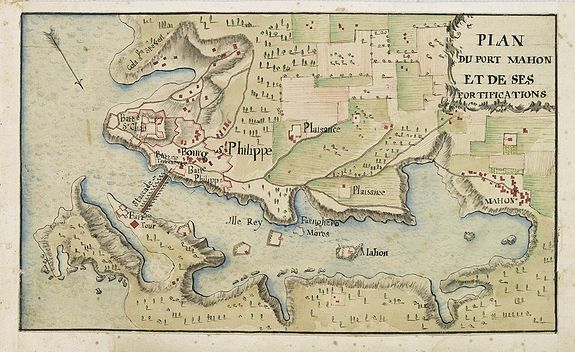 Description :Uncommon early French manuscript map of the bay and town-planof port Mahón. The entrance of the bay is blocked by "Staccades". St. Philip's Castle still in it basic shape and no signs of George Town. Port Mahon is one of the world's finest natural harbors and particularly strategically importance during the eighteenth century wars between the English and French Navies in the Mediterranean. Checklist of Charts of Mahon Harbour, mapforum 36. Condition : Pen and ink with water colour on paper. Contemp. added margins.